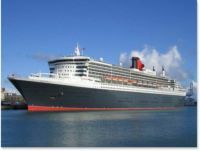 U.S. police arrested three people for questioning after suspicious submarine appeared near the docked Queen Mary 2 luxury ocean liner Friday. One person was inside the partially-submerged vessel and two people were in an inflatable boat. They were spotted near a security zone around the ocean liner, where it is docked at the cruise ship terminal in the Red Hook neighborhood of Brooklyn. It was not clear what the people were doing in the vessels, but police said there was no indication that the incident was related to terrorism. A detective from the New York Police Department Intelligence Division noticed the vessels at around 10:30 a.m. and summoned the Harbor Unit. The mysterious vessel was partly submerged and "appeared to be designed for underwater navigation," the NYPD said in a statement. "All three males are expected to be charged with a number of violations and both vessels will be secured by the Harbor Unit," the NYPD said. Photographs showed a vessel that resembled a diving bell, with a hatch on top. WABC reported that it "was equipped with oxygen tanks."